VAN NESS HOUSE was the subject of multiple complaints for years. 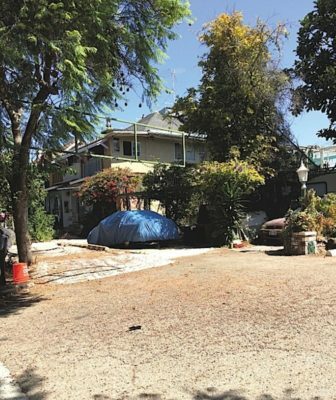 For at least two decades, activist Windsor Square neighbor Margaret Sowma complained to the city about unauthorized construction at 610 S. Van Ness Ave., just across the street from her Van Ness townhouse condominium south of Sixth St. and north of Fire Station 29. The across-the-street owner even hand-built a third floor of some sort on his roof. Palm fronds on fences were hiding a parking lot often filled with a dozen, mainly old, cars. The city would issue citations. Sometimes corrections would be made. Oftentimes not. But now, things will change on this block in the southeast corner of Windsor Square. There is a new sheriff in town! Well, actually, there is just a new property owner. But he is an experienced developer, and he has plans to improve the property with a townhouse project that complies with the Park Mile Specific Plan. Michael Winter, CEO of Federal Street Holdings of Chicago, has shown preliminary concepts to board members of the Windsor Square Association (WSA). The Park Mile zoning in this block of Van Ness, south of Sixth St., is for relatively low-density multiple family (RD-3) on both sides of the street. Sowma’s existing condominium building was built in 1980, following adoption of the Park Mile Specific Plan. Her building replaced at least one 1916 house. The dilapidated house at 610 was built in 1920. Winter’s townhouse project will be built on three lots, which include the two now used for parking. 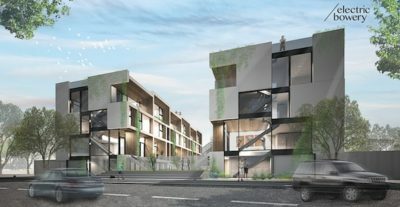 SNEAK PEEK of concept for 12 new townhouses on east side of Van Ness Ave. between Wilshire Blvd. and Sixth St. Accompanied by architect Cayley Lambur of Venice-based architecture firm Electric Bowery, Winter showed the WSA board the evolving designs for the dozen three-bedroom plus den, four-bath units, 11 of which will have attached two-car garages (with the other “restricted affordable unit” having two adjacent surface spaces). Winter’s firm recently sold the View Wilshire Tower Apartments, a 13-story, 168-unit building that he redeveloped at 3460 W. Seventh St.
Next steps for the Van Ness project will be meetings with other interested neighbors and review by the city Planning Department and the Park Mile Design Review Board. Winter said that the city has prevented his demolishing the existing decrepit structures until completion of additional reviews of the proposed project.